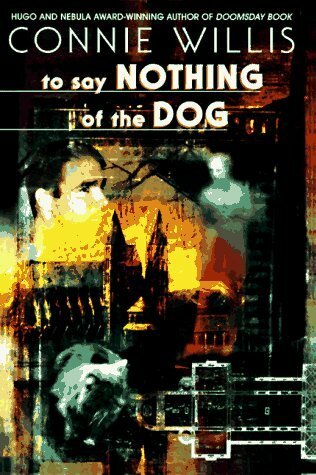 Why: It’s been far too long since we (Evan) awarded top marks to a novel, yet To Say Nothing of the Dog passed our rigorous 10 point inspection with flying colors. We encountered humor and mystery and love, to say nothing of the fact that this novel was modeled after Jerome K. Jerome’s brilliant masterpiece, Three Men in a Boat. We’ve got all kinds of rosy things to say, so buckle up, people. Nearly everything about To Say Nothing of the Dog was fantastic; from the Chattisbourne girls and their giggly personality to the strange side effects of Time Lag. Albeit brief, there was even a much anticipated cameo by the characters from Three Men in a Boat; Jerome, Harris, George, and Montmorency. While there was never really a memorable blow-milk-out-your-nose moment, the humorous undertone was significant and appreciated. The corners of our lips were curled up throughout. To Say Nothing of the Dog was also not a run of the mill time travel book... and instead of a Flux Capacitor our hero uses a much simpler technology called The Net. An individual’s impact on history is explored as the main character become more and more entangled in a complex mess of matchmaking, cats, and seemingly inconsequential artifacts. At times the complex plot did have us scratching our heads, but this was mainly due to areas of dryness on our scalp. The narrative had a definitive P.G. Wodehouse feel with an even wider array of characters. Ned Henry was the perfect character to lead us through the chaos and Verity Kindle was the perfect compliment, to say nothing of Terence, Baine, and Lady Shrapnell. Really, the only gripe we have was a blatant PPR (Premature Plot Reveal) related to The Moonstones. Before we could cover our eyes, the entire whodunit of this Wilkie Collins novel was reviled.... Grrrrr. We didn’t find ourselves head over heels after Doomsday Book, but this one definitely has us singing the praises of Connie Willis. On second thought, there won’t be any singing on this blog (you’ll thank us later). However, don’t let that prevent you from rushing out to try this multi-genre gem! I'm so glad to see your rating. I saw high marks at another blog and have it in my TBR. Can't wait to get to it. I recently read and loved this book too! I agree with the PPR...it didn't diminish my enjoyment of the book at all though - do you think she meant it to be so obvious? I had a seriously good chuckle with this book (and a couple of snorts here and there). Professor Peddick killed me! I love Three Men In A Boat (To Say Nothing Of The Dog)! I'm adding this one to my TBR list. I have had this book on my shelf for at least two years - ever since I read The Time Travelers Wife and the Tuesday Next series. Someone must have recommended this as a good follow-up. Based on your review, it is getting moved to the front of the shelf! Thanks! I like this book ,it very good.